This post is written by Jasmine Cutter, one of our Hubbard Fellows. 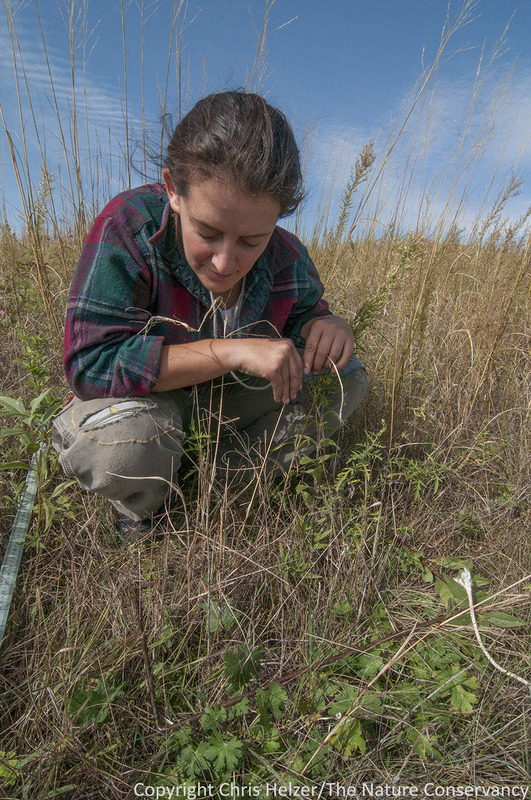 She has been studying the way small mammals use our restored and remnant prairies. Remember when I said I was going to highlight some more of our small mammal species? Well, at long last, here’s the second installment! Arguably the sleekest and most adorable of the critters I caught, the most distinguishing feature of the plains pocket mouse (Perognathus flavescens) is its fur-lined cheek pouches. Fur-lined cheek pouches!!! Imagine if, when you opened your mouth, on each side there was a little fur-lined pouch that ran all the way back to almost your shoulders! Gives me the heebie jeebies to think about, but pretty awesome if you’re a pocket mouse. The diet of the plains pocket mice is almost entirely grass and weed seeds, and the pouches allow them to carry seeds back to their burrows and cache them. Based on what I read, it’s thought that the purpose of these pouches being fur-lined is to conserve spit. 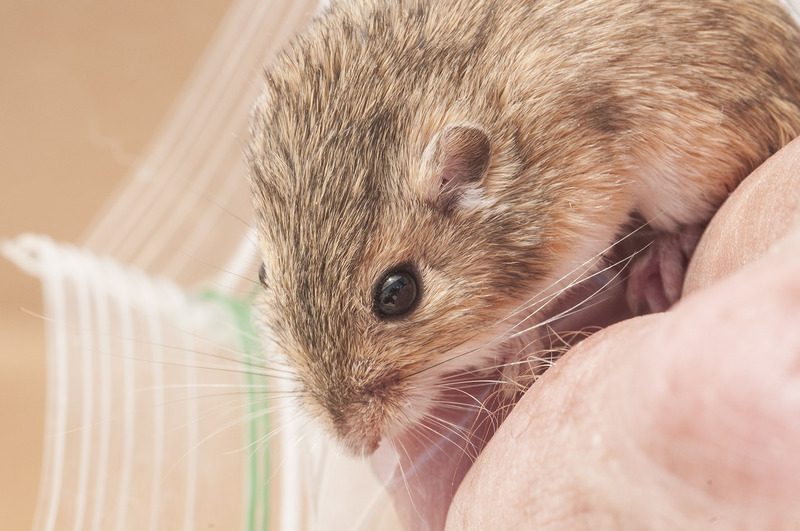 Pocket mice and their relatives (other pocket mice, kangaroo rats, kangaroo mice) are often associated with arid environments and these critters are all extremely water efficient. The thought is that if pocket mice had a hamster-like pouch, then every time they spit out the seeds they were carrying they’d be wasting precious moisture. If the pouches are fur-lined, then no spit wasted! Look at those cheek pouches! Remember, I was only holding this critter for a few seconds before I released it. only a temporary undignified moment, and then back to the sandhills! These adaptations help the plains pocket mice go for six weeks without water! Most of the moisture they need is obtained from seeds and their kidneys are extremely efficient. Furthermore, their habits also lend to water conservation; pocket mice spend most of the day underground in burrows where it’s cooler and more humid, they plug their entrance holes to keep in moisture (and keep out predators), and they can change slow their metabolism (enter torpor) when it’s too hot or too cold. The other crazy thing about the plains pocket mouse is that it is not closely related to any of the other rodents* that I caught. Those other rodents — northern grasshopper mouse, deer mouse, harvest mouse, voles — all belong to one taxonomic family Cricetidae (which includes true hamsters, voles, lemmings and New World rats and mice), whereas the plains pocket mouse is from the family Heteromyidae. Heteromyidae includes kangaroo rats, kangaroo mice, and pocket mice, though none are technically rats or mice. In fact, the plains pocket mouse is more closely related to pocket gophers than to any other rodent I caught! 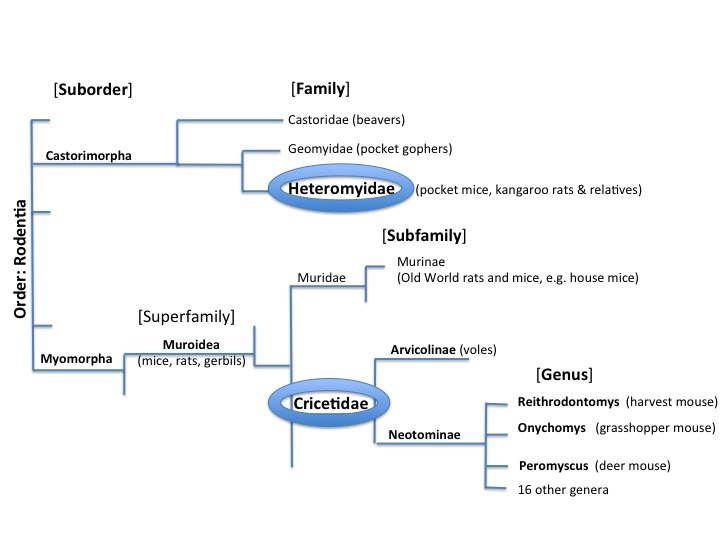 This is a very simplified phylogenetic tree of the Order Rodentia. Phylogenetic trees show the inferred evolutionary relationships among species based on similarities/differences in physical and/or genetic characteristics. So whenever two branches come together, it’s understood that the join represents the most recent common ancestor. FYI, there are a lot of other critters in the Order Rodentia that are not shown; there are 5 suborders I’m not showing and many branches that diverge from those suborders. Also length of lines is for convenience and doesn’t represent any timescale. All this is very interesting, but doesn’t help you identify a plains pocket mouse if you saw it in the field… In my mind, its key identifying features include its small size (usually 7-15 grams, 99-150mm nose to tail tip), small ears usually with a white dot below them, grooved upper incisors (if you hold them by their scruff, you’ll see a line down each upper incisor), and of course, their cheek pouches! They tend to be dark on their back, with a yellowish (“buff-colored”) line on their sides and white/pale underneath. They are most frequently found in (usually sandy) areas with friable soil. Sandhills are a good bet, as are other fields that have open sandy patches, especially ones that are grazed so they’re more open. In general, plains pocket mice seem to prefer sparsely vegetated areas (hopefully my data will test whether that holds up on our properties). In terms of why we care about them, well, they have awesome cheek pouches and barely need any water!!! What else do you want?? Just kidding, there are many more reasons why it’s worth paying attention to them. Most importantly, we still don’t know that much about them. Not a lot is known about their mating or winter habits, and until recently there were sizable gaps in our understanding of their distribution in Nebraska (see Geluso and Wright 2012). 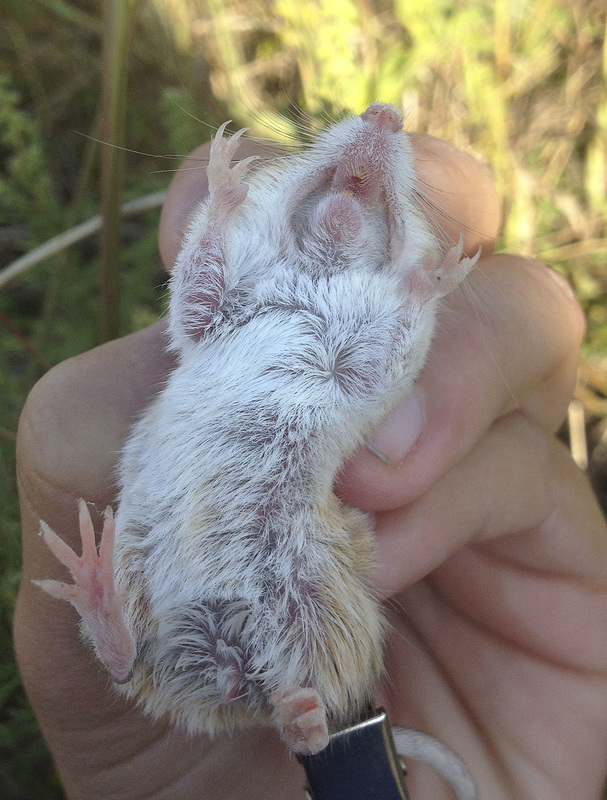 The plains pocket mouse can be found throughout the Great Plains – from Northern Mexico to Minnesota and the Dakotas; yet, it’s local distributions are less well understood. There also seem to be noticeable differences between critters on the western end of their range and the eastern end. So much so, that there are two recognized subspecies of the plains pocket mouse. There is a western subspecies, P. f. flavescens and an eastern subspecies, P. f. perniger. ** The eastern subspecies is considered rarer and has been deemed a Tier 1 At-Risk species by the Nebraska Game and Parks Natural Legacy Program. 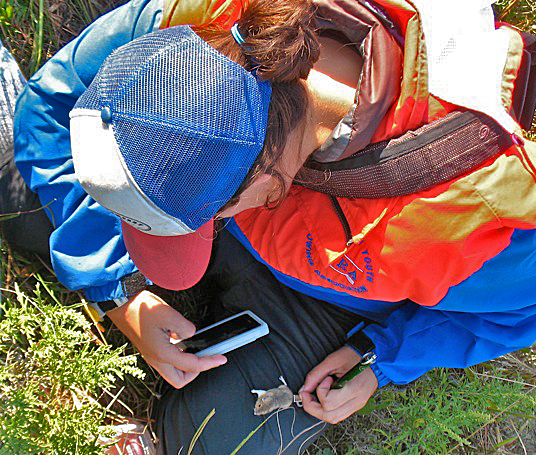 A photo of me taking a photo of a pocket mouse! Our Platte River Prairies are right at the edge of the alleged dividing line between the range of the western subspecies and the range of the eastern subspecies, which makes it an especially interesting place to study them. Are we seeing the eastern subspecies, or the western? At this point, the answer seems to be “yes!” Hopefully our population(s) will help the experts to parse the differences between the two subspecies and their range. Trying to define ranges is always tricky, especially because sometimes it’s hard to tell whether a species is actually not in a place, or if people just haven’t looked for it there. All of this is to say that there’s a lot more work to do! It’s exciting to study a critter that is still fairly enigmatic, and I’m excited to see what future studies discover both in terms of life history knowledge and range/subspecies questions! * Rodents are from the Order Rodentia, i.e., all the critters I caught except the shrews, the weasel, and the frog. ** The differences between the subspecies are very nuanced and my previous description (and pictures!) should still allow you to identify them as a plains pocket mouse. This entry was posted in Hubbard Fellowship, Prairie Animals, Prairie Natural History and tagged fellowship, hubbard fellow, jasmine cutter, nebraska, perognathus flavescens, plains pocket mouse, platte river, platte river prairies, s'mammals, small mammal by Chris Helzer. Bookmark the permalink. Moisture obtained from seeds?? Now that’s impressive. I do not believe the plains pocket mouse has made it into my state (Illinois). It is found just across the border in Iowa. Authorities say the Mississippi has probably prevented dispersion into Illinois. This is strange because the Mississippi did not stop the plains pocket gopher from entering the state. My state does have an interesting little mouse that I hear reports of locally. People occasionally talk about seeing Meadow Jumping Mice. Conservationists are actually breeding Meadow Jumping Mice at the Lincoln Park zoo for release into local habitat. Maybe we will hear more reports of golden gerbils fleeing from people in the future.